Do you have kids that are picky eaters, similar to the ones I have? Well, I have to admit that my kids are getting much better about making decisions when eating, as well as exploring newer options. For example, one kid is totally into raw, and cooked onions at this stage in his life. I’m down with that. Not too long ago my daughter was into exploring other breakfast options, and that’s when I saw a box of instant oatmeal in my pantry. Strawberries and cream to be precise. Let’s just say that was short lived, as after only a couple of packets, she had no interest. AT ALL. That left me with the rest of the box of packets just sitting there. That’s when the idea sparked. 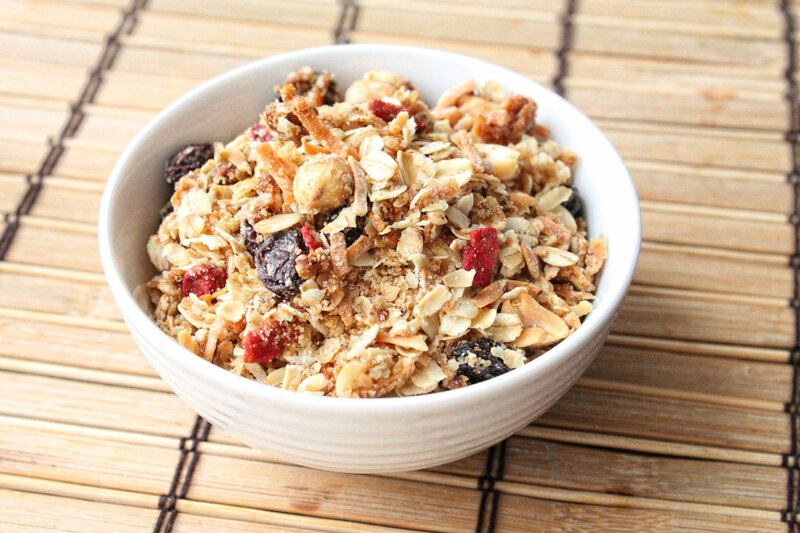 How about making instant oatmeal granola? At first I thought this may result in a less crunchy granola, and one that might be a bit dry and dusty, but that was simply not the case, and furthermore, my kids loved it! Next, add everything to a mixing bowl, with the exception of the powder that gets sifted from the instant oatmeal. Mix well to incorporate the sugars, oil, and molasses. Place this onto a lined baking sheet, spreading it evenly out on the sheet. Place the tray into the oven and cook for about 45 minutes, stirring about 20 minutes into baking. Cook until the granola is nice and crunchy, then remove and let it cool. What was awesome about this instant oatmeal granola is that I was able to use up something that my kids probably would have let go to waste, and not only that, but those strawberries in the instant oatmeal really made this granola shine. No joke on that front either. And you know what, my daughter who no longer wanted to eat that oatmeal was shoving fistfuls of this stuff into her mouth as an after school snack! So if you have packets of instant oatmeal left, give this a shot, just remember to do a quick sift, and you should be all good to go! Hope you enjoy!